Delays have pushed the opening of the new public park on the site of the former Meadowbrook Country Club back several months. 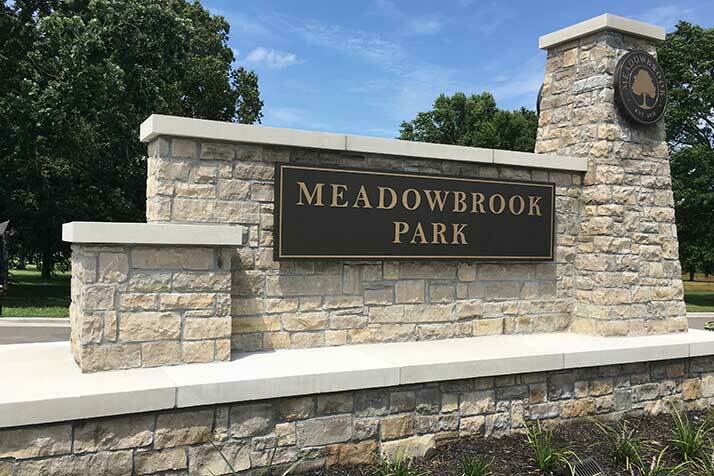 Rainy weather and adjacent construction projects have caused months of delays to work on Meadowbrook Park. 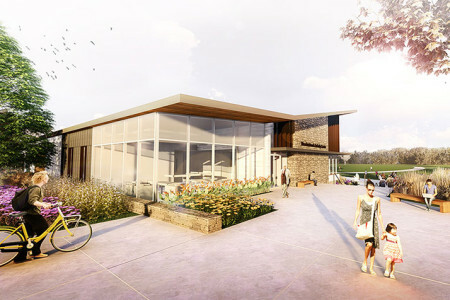 A rendering of the new Meadowbrook park activity center now under construction. Interruptions to providing utilities onsite is causing a number of delays. For instance, the spillway had to be reengineered and reconstructed because of the heavy storms this past spring. The long, cold winter also “presented some challenges with making significant progress during this time,” Markham added. In addition to the construction work on the park, Johnson County Wastewater is completing a second phase of sewer district improvements that have delayed work in the southern and northwestern parts of the property. Markham said the wastewater work is nearing completion and will allow the park construction contractor to finish the remaining scope of work in that section of the park. Markham said that so far, most of the development south of Meadowbrook Park Parkway has been completed. Meadowbrook Park Parkway features ponds, trails, pedestrian bridges, a spillway and some landscaping. “The destination playground, senior exercise equipment and pickleball courts are scheduled to be installed or constructed in July,” Markham said, adding that the trails have mostly been cut in and rocked with asphalting in progress. Other items left to do along Meadowbrook Parkway are turf establishment, a section of asphalt trail and anchoring the bridges, which are scheduled to be completed soon. Most of the work is complete on the restroom facility north of Meadowbrook Park Parkway, as well as the steel framing for the three picnic shelters and large pavilion. The Meadowbrook Park Clubhouse is also mostly framed; construction is in progress on rough in, drywall, electrical and HVAC work. Markham said Harmon Construction, the contractor, believes the park will be complete in 60 days, including substantial completion of the building and remaining amenities within the park. An official opening date of the park has not been set yet, but the park and recreation district anticipates opening in late summer or early fall.